The U.S. Treasury Department has released details on proposed regulations involving the tax implications of certain investments in “qualified opportunity zones” (QOZs). These proposed regulations are in response to a provision included in last year’s Tax Cuts and Jobs Act, which has piqued the interest of investors because of its tax incentives and benefits to communities. The program’s goal is to spur economic development and job creation in these distressed areas. After the program was announced, more than 8,700 low-income communities were designated by U.S. states, territories and the District of Columbia, and later certified as QOZs, by the U.S. Treasury. But what do the investments look like, and what are the tax breaks? Although the details are still being ironed out, what we do know is that a “qualified opportunity fund” (QOF) will be the investment vehicle from which the QOZs will draw, and the invested capital will, in turn, be used for development of the QOZs. QOFs are required to hold at least 90% of their assets in a property located in QOZs. 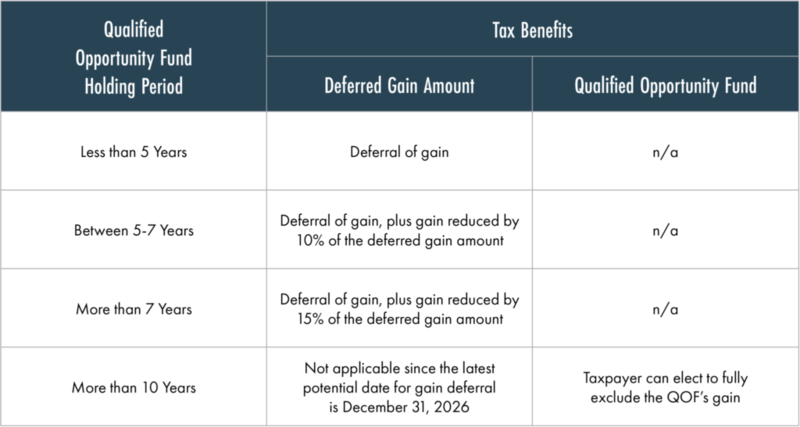 A taxpayer may defer capital gains by investing all or a portion of those gains in a QOF — this is the taxpayer’s “deferred gain amount” (DGA). The DGA must be invested in a QOF within 180 days of the realization of capital gains that are to be deferred. For example, Susan Jones recognizes a $250,000 gain on a June 30, 2018 sale of XYZ stock; to defer the gain, Susan must invest the $250,000 (her DGA) in a QOF within 180 days of the June 30th sale date. Once the DGA has been invested in the fund, the gain associated with the DGA is deferred until the earlier of: the date the investor sells the QOF investment or December 31, 2026. If the taxpayer holds the investment for five or more years, the tax basis in the DGA is increased, reducing the total amount of capital gains taxes and providing a tax savings (see table below). Taxpayers who hold the fund for more than 10 years can choose to fully exclude all capital gains accrued on the investment when it is sold (the taxpayer must still pay tax on the DGA on or before December 31, 2026). Special Note: Since December 31, 2026 is an important trigger date for recognition of the DGA (as explained above), taxpayers would need to make an investment in a QOF by 2021 to receive the special five-plus year tax incentives (10% basis adjustment) or by 2019 to receive the special seven-plus year tax incentives (15% basis adjustment). On July 15, 2018, John Smith recognized a $750,000 gain from the sale of various securities. Then, on November 20, 2018 (within 180 days of the July 15 sale date), John invests $600,000 in a QOF. He has elected to defer $600,000 of the $750,000 gain, having invested the $600,000 (John’s DGA) in the fund within the 180-day window. The remaining $150,000 will be treated as a taxable gain on his 2018 tax return. As of December 31, 2026, John still owns his investment in the QOF, and must pay capital gains taxes on the deferred gains; the DGA basis is able to be increased by 15% because the investment was held for more than seven years; thus, the DGA is reduced to $510,000 from its original invested amount of $600,000. He holds the investment for more than 10 years, selling the QOF for $800,000 on December 31, 2028. This $200,000 gain ($800,000 less the $600,000 originally invested) can be excluded from capital gains taxation at John’s election. Higher Risk – The investments in economically distressed communities may entail a higher degree of risk, relative to more developed markets. Timeline – To maximize the tax benefits, an investor needs to hold the QOF for at least five years, and ideally more than 10 years. Due Diligence – An investor must have a high degree of confidence that a QOF will hold at least 90% of its assets in a QOZ property; otherwise, any potential tax savings could be jeopardized. Opportunity Cost – The future return potential of a QOF (combined with potential tax savings) should be compared to the future return potential of other investment opportunities. Before investing in a QOF (or any investment), we recommend that investors consult with an appropriately credentialed advisor and ask questions specific to their situation to help ensure a good fit within their overall portfolio allocation. These materials were prepared for informational purposes only. Information has been obtained from a variety of sources believed to be reliable though not independently verified. This presentation does not represent a specific investment, tax or other recommendation or legal advice, and does not take into consideration your particular circumstances, financial or otherwise. Examples provided herein are for illustrative purposes only and do not represent actual or anticipated results. This is not an offer to sell or buy securities. Please consult with your advisor, attorney and accountant, as appropriate, regarding specific advice. Past performance does not indicate future performance.